We all learn lessons from our Exes. Some of these lessons were hard to learn and even though, at the time, I wished I had not learned them, I am glad for the knowledge these exes gave me. Lesson #1: Like father, like son. John was funny and charming, just like the father he was named after, but during our phone conversations, I began to notice something. His father was a yeller and he seemed to always be upset about something. The longer we dated, the more mean John became. He yelled at me for things and was just downright miserable. My mother sat by me and held my hand after she told me that no 16 year old girl deserved to cry so much over a boy. Thanks, Mom. Lesson #2: Pay attention to how he treats his mother. If he treats his mother like a queen, chances are he will do the same for you. Beware that he does not cross the line into a “Mama’s Boy,” however. Sean was a sweetheart who picked you up for dates and held open doors. He did everything his mother asked of him; even break up with his girlfriend. I was deemed to be taking up too much of HER time, it being his senior year and all. No more “Mama’s Boys” for me. Lesson #3: Saying “no” is hard. Draw your line and respect it. Do not let a single person make you compromise your convictions. Rob, a different Sean, and a few more nameless fools all decided that because I was not ready, I was not worthy. After once, or even twice, of having a boy break up with you over something like this, it can make you start to question your choices. Saying no may be hard, but you will have more respect for yourself in the long run. Lesson #4: Not all men deserve your trust. While in college, I was seeing Ian. I came back from soccer practice one night, wet and exhausted. My roommate had the “code word” written on our door and I had to wait in the lounge on our floor for three hours. At the end of this time, Ian left our room. Guess we were interchangeable. Lesson #5: Follow your heart. There is always a gut feeling when you begin dating someone. Listen to it and you will save yourself time and heartache. You cannot change someone who is not willing to change themselves; you should never try. The “bad boys” will always remain as such and they are not the kind of man you want for the rest of your life. 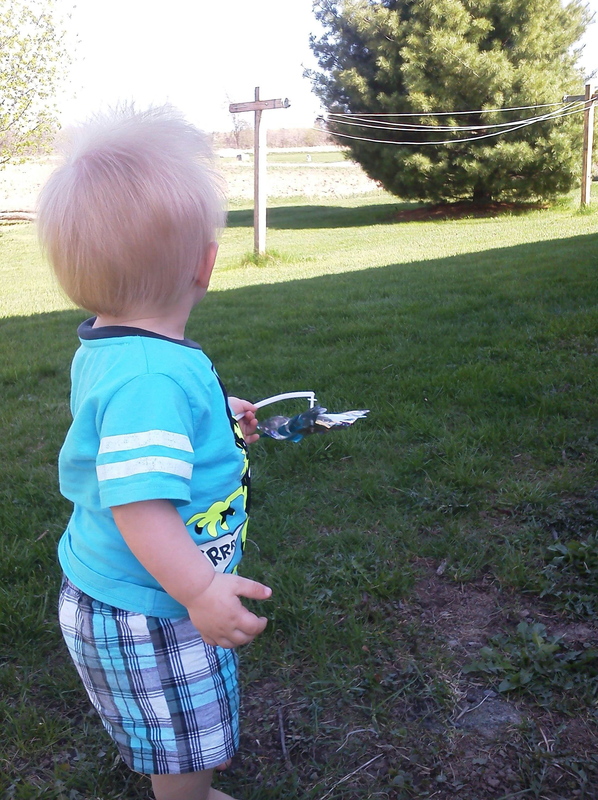 My little boy sure does love to play outside! With the weather here in NY finally starting to get nice, MJ and I will go for walks or to the park in the morning before I head to work. Even if we just hang out in our own backyard he is a happy camper. In fact, he likes it outside so much that when I start to pick up his toys to go in the house for lunch or nap, he starts to cry. He is definitely his father’s son. I think CJ would be content to stay outside all day every day if he could. 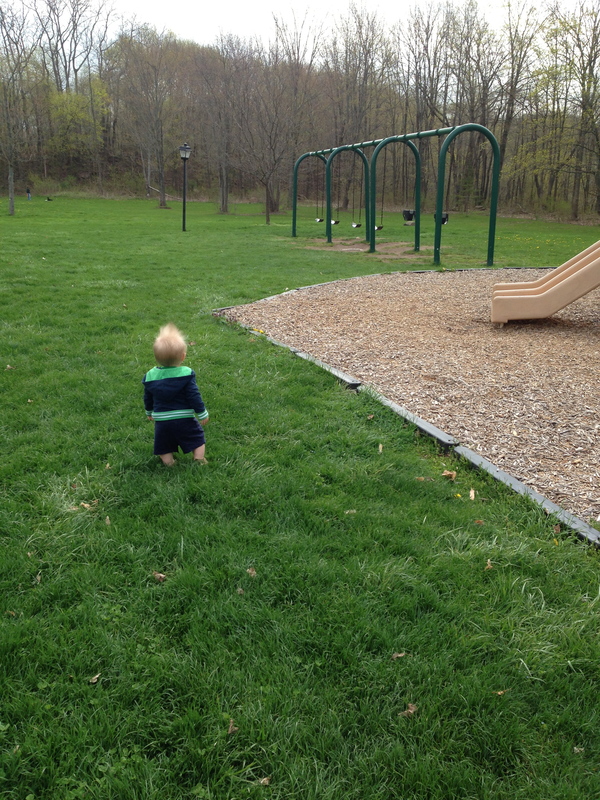 MJ at the park. He looks so little. Playing at his cousin’s house. Today is a day of frustration. My sister watches MJ for a few hours on Fridays, between when I leave for work and CJ comes home. I always drop MJ off at 2:00pm. ALWAYS. Today, at quarter to two, my sister called me and said to not drop MJ off at her house – she was out getting her nails done. Are you kidding me? She relies so heavily on my babysitting money to drive her daughter back and forth to preschool that she hounds me about it every week (even though I give it to her the same day every time), yet she has money to blow on a manicure. WTF. She wanted me to drop MJ off at Walmart, where she was getting her nails done, but I did not want to. He has been sick for the past few days and was finally getting better. I did not want him in and out of cars, running around, etc. Plus, she has two girls of her own to handle while her nails got done. I really did not have a choice because I do not have someone else to watch MJ. As I was driving to Walmart, my sister tried to call me. My speaker does not work, so I did not answer. She immediately tried to call again so I pulled over to take the call. There had been a change of plans. As her nails got done sooner than she thought and her girls were hungry, they were going to go to Pizza Hut. I was livid. I did not want him in a public place around other people when he was sick. I did not want her feeding him – we are a paleo family, whether she agrees with that lifestyle or not. She promised she wouldn’t and they would go straight home. I did not believe her. CJ and MJ always come to visit me on Friday nights on my dinner break. MJ looked terrible when they got here and CJ looked like he was ready to kill my sister. MJ had gone from looking and sounding almost 100% better to being so sick it was heartbreaking just to listen to him breathe. There was no way my sister had taken him straight home. CJ tries his best not to take his frustrations out on me as he knows she is my sister, but I agree sometimes. I will always love her, but her nonchalance when it comes to the care of MJ really bothers me. I do not have anyone else to watch him while I work and I only work part-time so he can spend most of his days with me. Both CJ and I wish we could figure out a way where I could stay home and he could always stay with me. Plus, my sister is pregnant with baby number three, due in August, and there is no way I am going to let her watch MJ after that. Most work-from-home jobs do not seem legitimite and they scare me away from even trying to investigate them further. I would love to watch a few children in my home as I used to work at a daycare for three years, but all my ads and fliers do not seem to be doing any good. Hopefully something good comes our way soon. While we were staying with my grandparents, our chocolate lab, Marley, got used to there always being someone home. Even though she is home alone for less than four hours on average, we could tell that it was starting to get to her. For our birthday, CJ and I decided to spend some birthday money on a friend for Marley. CJ started doing some research and found a litter of puppies on the Open Arms Rescue website. Their adoption fee was more than reasonable and included everything. We went to an adoption event and were able to play with all the dogs they had there and make our selection. The puppy we chose was not yet ready to leave her mother, so they had us write our name on her collar. We then had to provide the phone number for our vet as a reference to being responsible pet owners. Also, the OAR does home visits. As we live about an hour away from their headquarters and the weather was bad that weekend, we were allowed to send in pictures of our home. We picked up the new puppy this past weekend and brought her home; named her Presley. MJ absolutely adores her. This is great because once she is house trained, we want her to sleep in with him. Marley already sleeps with us and we cannot fit another dog in our bad. MJ seems to be the only “child” who likes her so far. Marley seems to not care for Presley at all. We are trying to constantly reassure her that she is still our girlie and we love her. Hopefully, she quickly gets over her shyness and will start playing with Presley. Marley needed a friend and I do not want her to act weird around her sister forever. 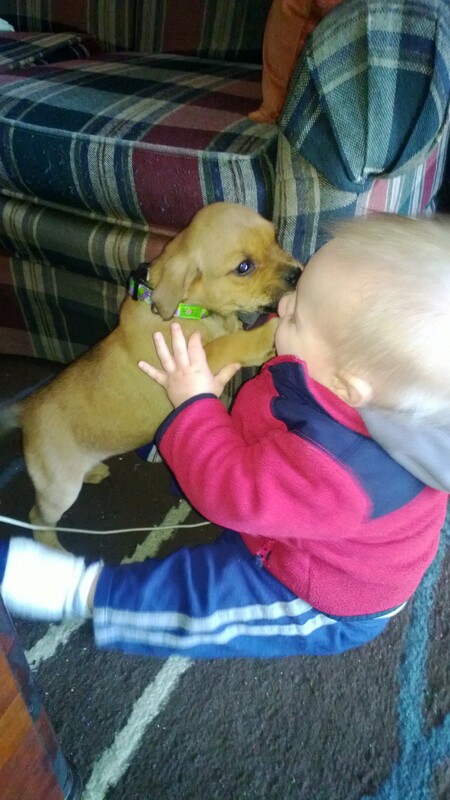 Presley already adores Marley and attempts to follow her around, when Marley will let her that is. I think MJ will be the one to finally get the girls to the place were they are okay with each other and play with one another. I already knew CJ was a great guy, but a few days ago was one of those days where you can really see what you have and be so unbelievably amazed by it. She looked completely relieved, as no one else had stopped to help her. He proceeded to help her load two large bags into her cart and then we went on our way, finished our shopping, and went home. When we got home, I pulled the pork out of the crockpot and began to shred it for dinner. MJ puttered his way over to me and stood between my legs while I was working. I heard CJ ask, “Where’s my baby boy?” MJ stuck his head out from between my legs, looked at his dad, and laughed. He laughed so hard – I adore baby giggles. CJ continued asking where MJ was and MJ continued popping his head out and laughing. As all babies do, MJ played this game way past the point where it was actually fun, but CJ continued right along without sounding frustrated or tired of it. He constantly surprises me with how he has seamlessly transitioned into being a dad from having never been around small children before. He is just absolutely amazing and I hope he knows that I realize how lucky I am to have him. Today marks my first day as a published writer on the Yahoo Contributor Network. I know it is not a lot; CJ tells me all the time that anyone can publish stuff on there, but it is a step in the right direction for me. Anything that furthers my writing career is okay in my book. It is not a very big article, there was only a 400 word limit after all, but I am proud of it anyway. CJ tried with all his might to get the wireless working so I could be up and running on here, but for all his efforts, he just could not seem to make it work. He is normally such an IT wizard that we were both shocked he could not make it work. Surprisingly enough, I am the one who got it to work although if you asked me I could not tell you how I did it. MJ has been taking four or five steps only for the most part, but I just saw him walk across an entire room! He is only 10 months old!! Where did the time go? It really needs to slow down and it can happen at any time now. Nap time for the little guy now, so time to get some unpacking done. All but one room that we wanted painted is done so no more pink! Will post a few pictures once there are less boxes to mar the view.